Ok- who is doing those Oakmont rain dances? I am investigating all possibilities. Please give us a break just long enough to pour concrete and do asphalt paving! 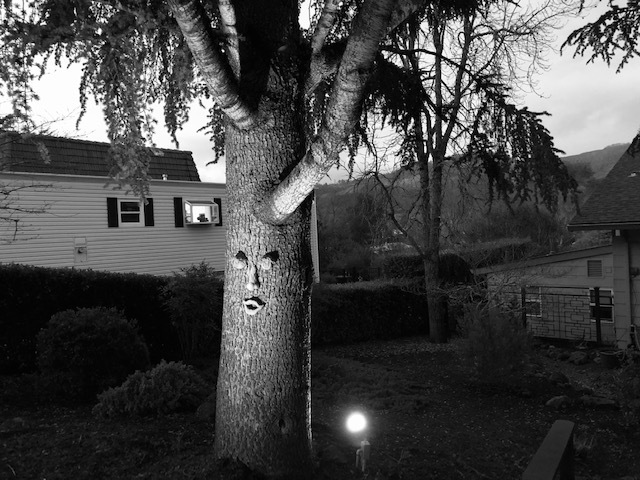 This spooky tree at my neighbor’s house is watching you! 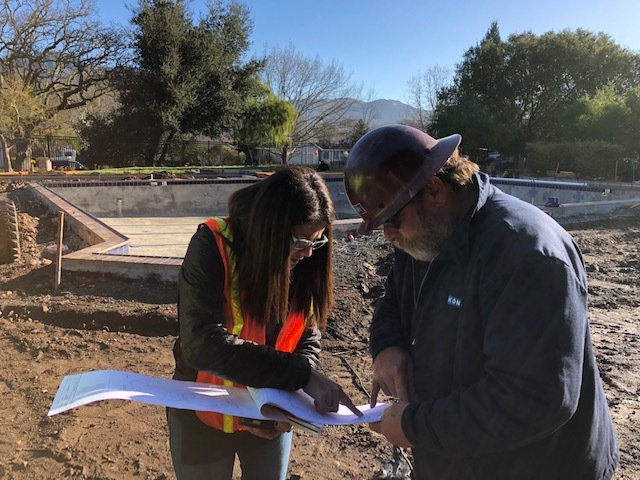 In between the rain, Monica Shah of Summit Engineering met with us to try to work out the final details of the field conditions versus the theoretical drawings for concrete deck slope that is soon to be poured. (Remember when one crew of our astronauts once had to use duct tape to get back home safely? That explains the difference between the best laid plans and use of Plan B in reality.) Sometimes field conditions don’t allow one to pour exactly as anticipated on paper drawings. The ADA question to solve was the slope of the concrete pool deck as it approaches the pool equipment room. That was the only place we could not meet the proper slope as you get into the doors there. Every other slope around the entire pool area was solvable per plan with a little head scratching on Troy’s part and a little more sidewalk replacement from the bridge and the side gate at the service road. But the pool equipment room was the last piece of the puzzle. We finally called in the architect and voila! He found a part of the building code that said entering an equipment room by service people did not have to meet the minimum ADA slope. The concrete everywhere except by the pool equipment room can only be 1/2 inch lower than the entrance door. The pool equipment room works out to be 1.44 inches below its entrance doors. 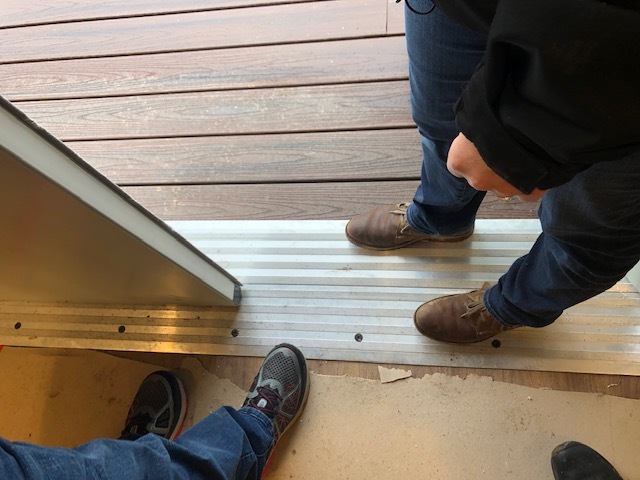 We will put an extended threshold there for no tripping hazard but this is a sample of the quandaries a construction site manager deals with on a daily basis. 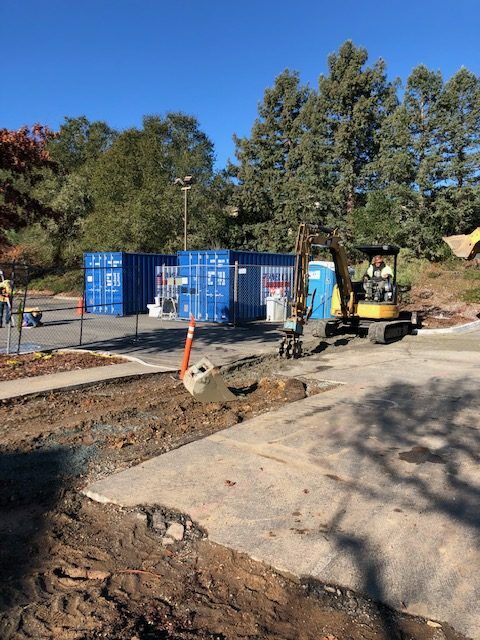 Below the deep trench that was cut for the fire line supply has been filled with the special rock fill that had been delivered and was sitting on an area of the parking lot. Today below you can see the nicely compacted fill rock in the trench which you can barely see now. That trench will be finally finished with new asphalt…when the sun begins to shine. To try to keep the deep pier holes that are waiting for concrete from filling with rain water, Troy has plywood over the holes. Today the inspector came out and inspected and approved the pier holes and rebar. 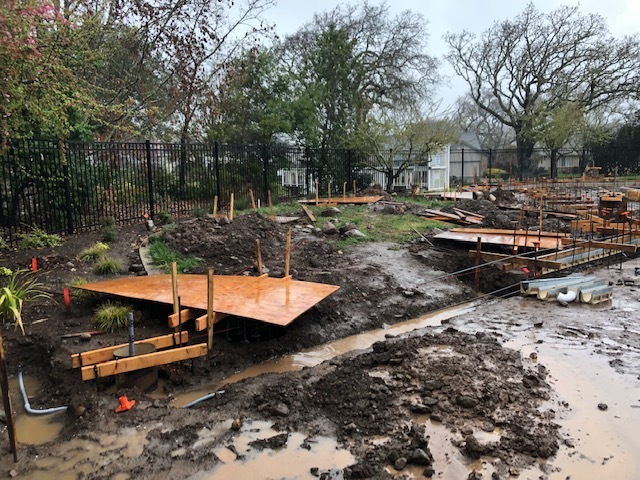 These particular piers are for the shade sail installation. 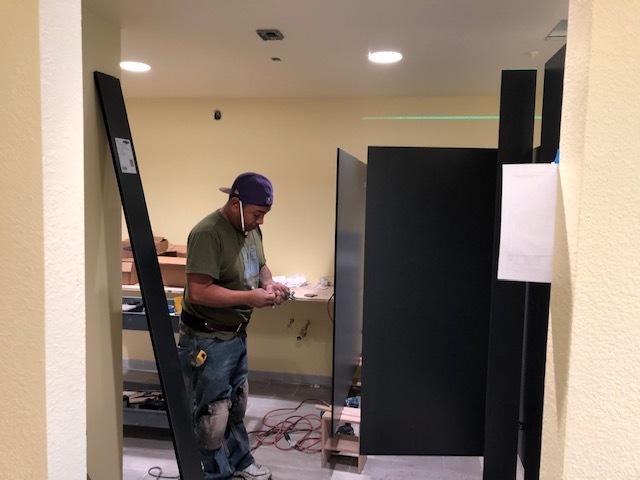 Meanwhile inside the downstairs bathrooms are getting their toilet partition walls installed. The downstairs bath walls are a very perky yellow. Don’t come in the locker room in a bad mood. The yellow will not allow that! 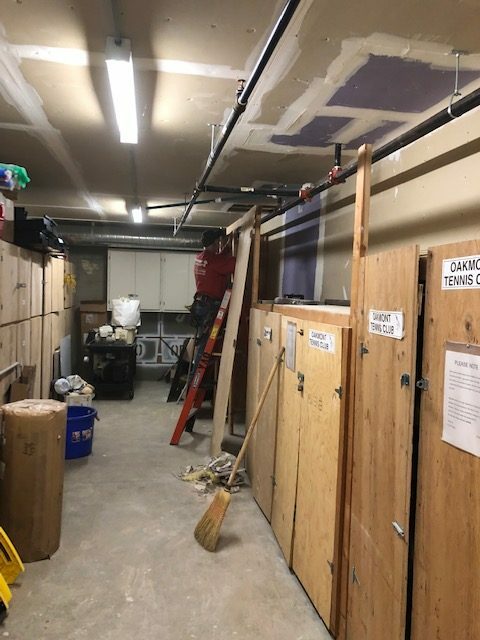 There is a storage room behind the downstairs bathrooms where a lot of mechanical things happen and do not have to be hidden. 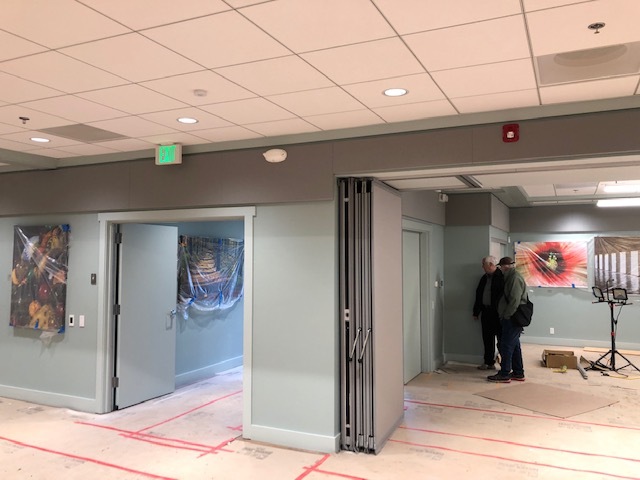 Those major pipes are water firelines to service the new fire sprinklers that go into all of the rooms in the building, including the billiards room. 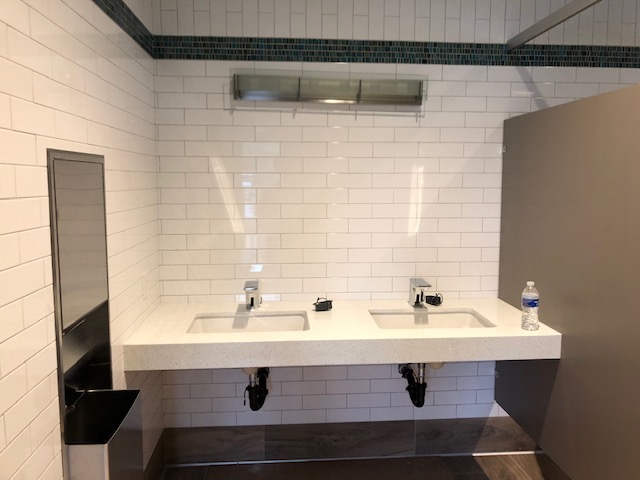 The new sinks and counters and faucets in the upstairs baths have been installed. Below shows you the physical strength and flexibility required of plumbers. They almost always have to do full squats or lay on their back. It is a tough trade requiring its participants to be very physically fit. 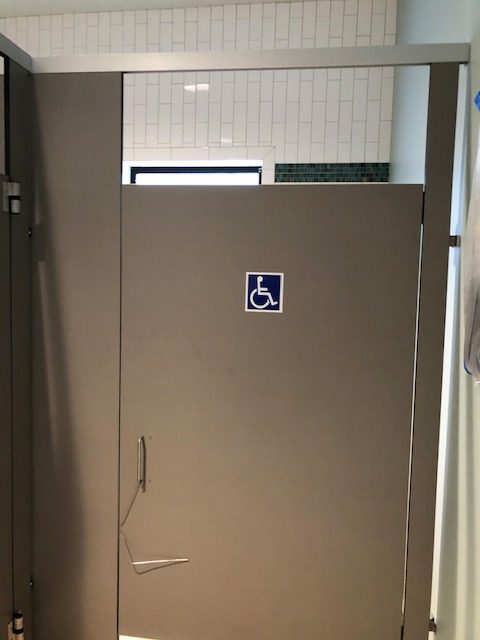 We truly have an ADA bathroom now! See the signage below. Hallelujah. If you remember we opened up the conference room walls to let it be part of the main room with big gatherings. The acoustic sliding partition walls were demonstrated by Troy today. 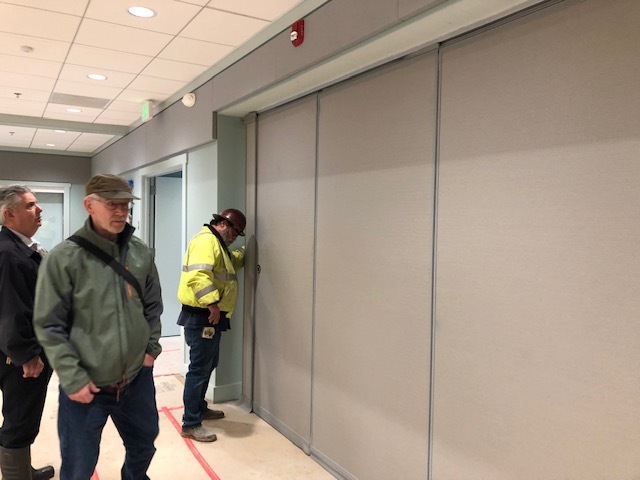 You may notice that the color of the horizontal gray acoustic wall panels above Troy and David’s heads are color coordinated to work together with the standard color selection we made for the folding panel partitions. The quietness and lack of echo makes hearing so much better in these rooms, so we know the acoustic panels are doing their job. 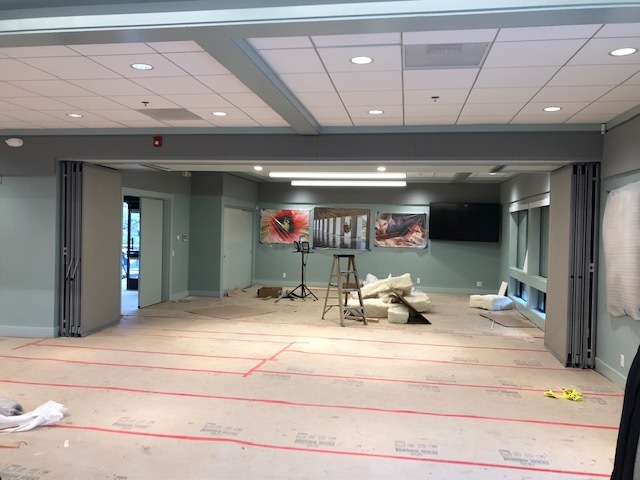 Below you will see a lighted exit sign, an automatic light that turns on in emergencies, a red emergency fire alarm light and a fire sprinkler hanging down from the ceiling panels. Function always supercedes form and appearance, no matter how hard you try to obscure these technical things. They are required by code to be in certain locations….and “so it is”. Here below you see how tightly the folding partitions close up against the opened up side walls of the conference room. These upper square little windows all have sun screens in them now, so the glare will be reduced on very sunny days. 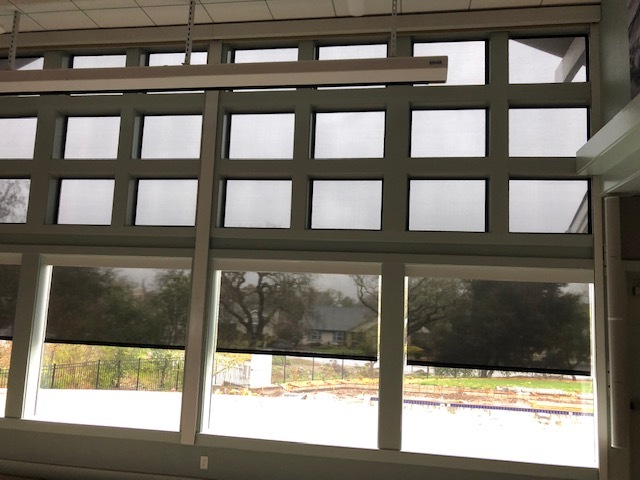 The interior shades were being tested and you can see the difference…you can still see outside with them down.These interior shades that lower will gladly be used on sunny warm days, which are predicted in the near future. May it soon be so! We were testing the television in the conference room today. It will be a secondary screen or a separate program should there be two meetings at once in the East Rec. 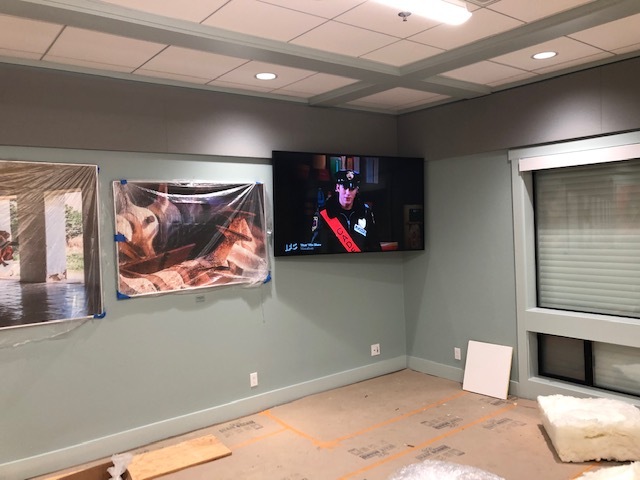 It can have the powerpoint of the speaker in the main room on it at the same time as the big screen has it, or it can have a separate video or power point on when it is shut off from the main room for a separate meeting. 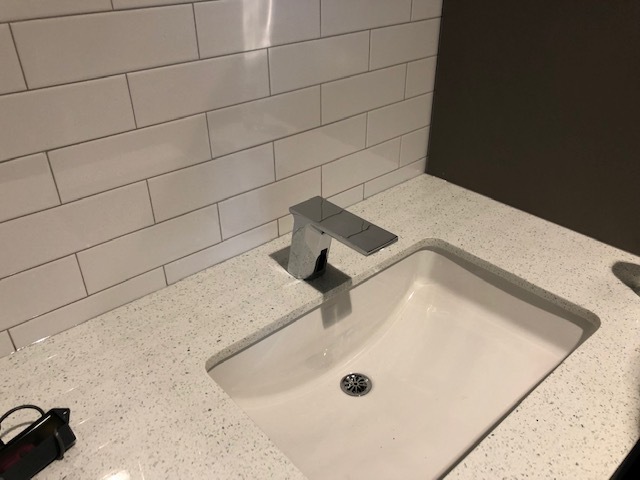 The sink faucets are motion activated…put your hands under the spout and you will get water. 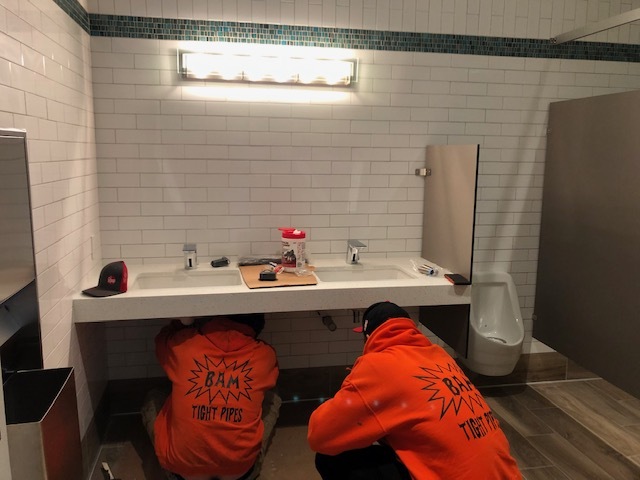 Soap dispensers are next after the mirrors are installed. 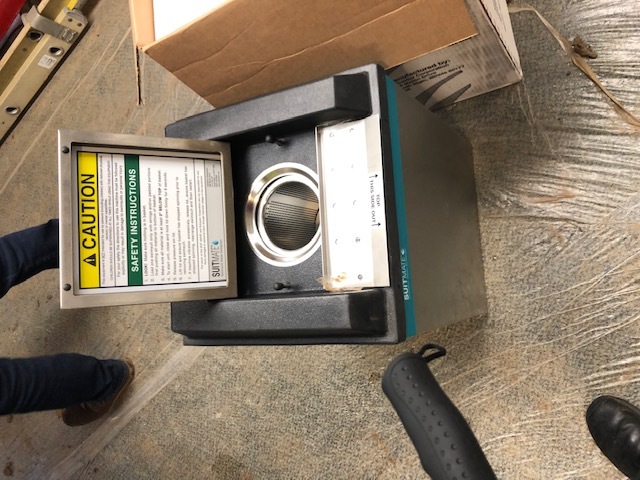 Below is the new swim suit dryer ready to install. 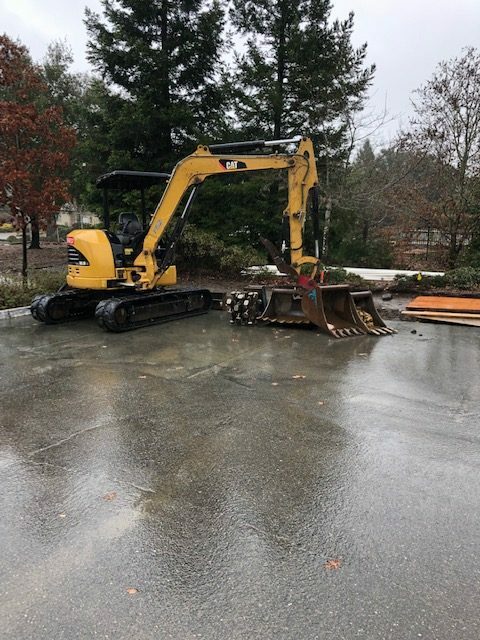 Now back to that rain dance…want to see this construction equipment go away someday? Good news on pickle ball and tennis…. 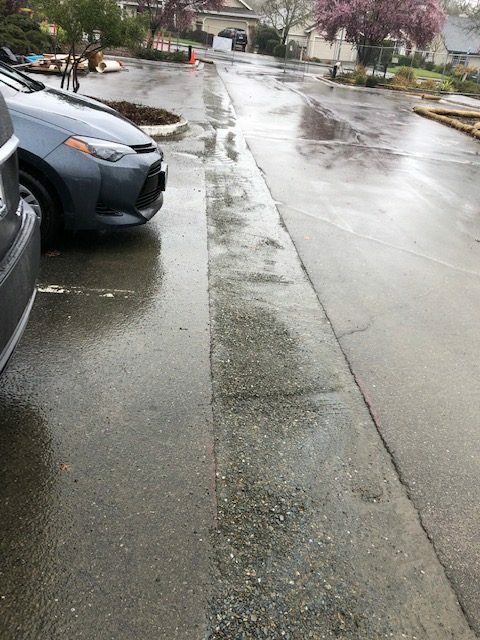 After this week, the parking lot will remain closed, but playing pickleball and tennis is ok all day long as long as you park your car on Oakmont Drive and walk up the service road. May 1st will be the grand opening at 3:30pm. Plan to be there!